Duke is technically 31-5 so far on the year. But everyone knows that 60 percent of those losses don’t count. 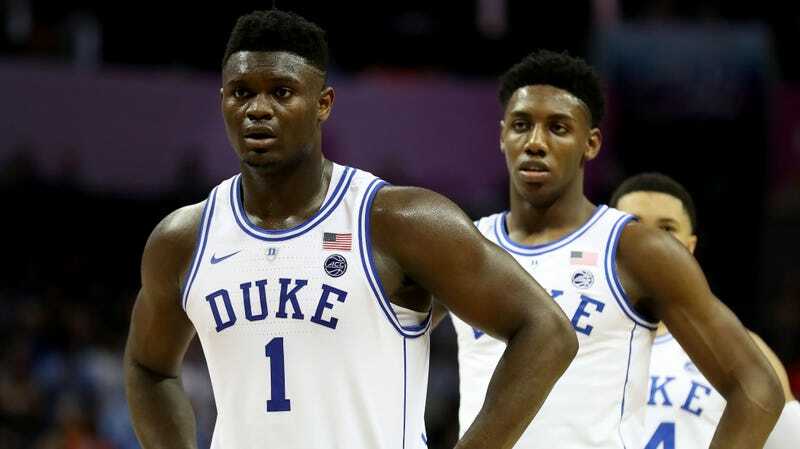 The top-seeded Blue Devils are a completely different and much worse team without Zion Williamson, and when he’s in the lineup, they’re 28-2, with zero losses since Jan. 14. That’s a really scary fact if you’re one of the teams lined up to face Duke in the remaining four rounds of the NCAA Tournament, but that doesn’t mean it’s time to despair. Zion’s Duke can be beaten. Gonzaga’s done it. Syracuse has done it. And Florida State, Virginia, Louisville, North Carolina, and UCF have all come agonizingly close to knocking them off. The question is, how? Tre Jones, who’s shooting just 23.2 percent from deep on the year, is the weakest link. UCF, in their near-win, showed a willingness to leave the point guard totally alone on the arc in order to put reinforcements on Williamson, and Jones responded by going just 1-of-8 on threes. But the three is the path of least resistance, and that’s where teams would like Duke to walk. Of the 43 three-pointers Duke took in that Syracuse loss, they made just nine of them. That’s good news for Duke’s next opponents, Virginia Tech—a team that notoriously held NC State to just 24 points in a game back in February. The Hokies’ zone defense is ready and willing to give up some long-range shots if it means keeping opponents out from under the basket. On the season, 50.4 percent of their opponents’ attempts have been threes, which is more than anyone in the whole country besides Monmouth. The corollary to forcing fairly low-percentage shots is limiting turnovers, because Duke will murder you when it gets easy opportunities in transition. To do that, opposing offenses must have an awareness of where Williamson is on the floor at all times. Reddish and Jones are no slouches either, but Williamson is especially gifted at sensing when a pass is about to be thrown, or when a ballhandler is vulnerable to robbery. After that, it’s academic. When a team hands the ball over to Duke, you can just close your eyes and add two points to the scoreboard. As you may have noticed, Zion Williamson is going to be the focus for anyone playing against Duke, but despite all the attention he’s received this year, nobody has yet figured out how to contain him, besides maybe sabotaging his sneakers. Zion is going to score, whether Duke wins or loses, and whether it’s a blowout or a close one. He basically hasn’t had a bad game all season, getting to double figures every single night and usually picking up a whole lot more. But everyone else on Duke has struggled on at least one occasion, and forcing them to make the plays, and not Zion, can help teams hang around. North Carolina’s 74-73 ACC Tournament loss is the ideal here. (Yes, it’s still a loss, but only because the Heels shot 15 percent from three.) Only three Blue Devils hit double figures on that night—Zion went 13-for-19; R.J. Barrett went 5-for-15; and Tre Jones went 5-for-14. And in a two-point win over Louisville in February, Williamson and Reddish led the way, while Barrett only managed a 4-for-14 night, and Jones went 2-for-10. For teams less comfortable clogging the inside with zone, playing tough, high-pressure one-on-one defense on Duke’s four other players can be enough—or, maybe more accurately, almost enough—to beat them. Barrett, Reddish, and Jones are all guys who struggle with consistency but not with confidence—they’re perfectly willing to shoot from areas where they’re not all that successful—and perhaps a smothering, switch-friendly defense like Michigan State’s could lead them into the kinds of mistakes and poor decisions that swing a game. But, finally, there’s still the little matter of scoring on Duke, which might be the hardest task of all. We’ve already covered their propensity for steals, and Williamson and Javin DeLaurier are top-notch shot blockers down low. But even on the outside, Duke’s defense is painful for opponents; teams make on average just 29.8 percent of their threes against the Blue Devils. Gonzaga scored 89 on Duke early in the year, but more recently, there’s really only been one kind of scorer who’s given Duke trouble—a power forward type who’s equally comfortable driving the ball or shooting from deep. Louisville’s Jordan Nwora and Virginia’s DeAndre Hunter fit that bill, but in their last game, it was UCF’s Aubrey Dawkins who seemingly held the key to unlock Duke’s D.
Dawkins, who scored 32 points on just 18 shots, was able to lose Reddish with sudden bursts of off-ball speed, beat Barrett multiple times on drives, and overpowered Jones when the point guard switched onto him. Going 7-of-11 from two and 5-of-7 from deep, Dawkins knew how to use screens to get open, and showed little hesitation to fire when he received the ball. 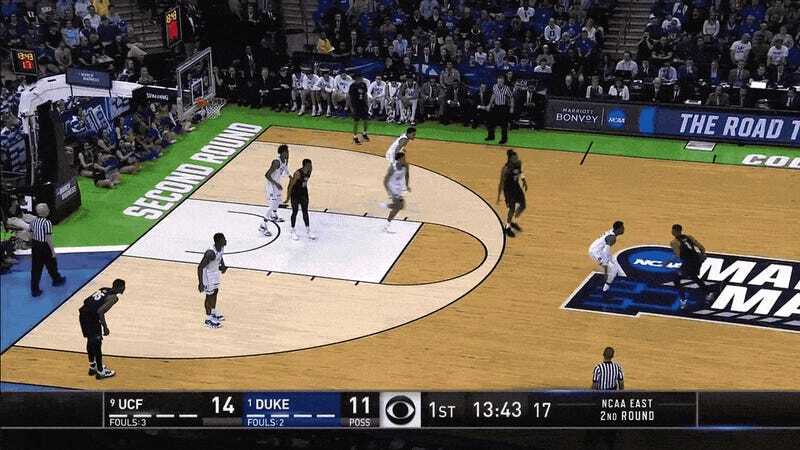 In my favorite UCF action from the game, which they used a couple of times, Dawkins would exit the paint as soon as another teammate entered, and the brief moment of Duke confusion that this caused would be enough for him to take advantage. Knocking down catch-and-shoots will be crucial for any team that wants to beat Duke. Against the Blue Devils, players aren’t going to get more than a flicker of an opportunity, and wasting those chances will make an already-uphill battle even steeper. On Friday, it’ll be Virginia Tech’s supporting shooters, Ty Outlaw and Ahmed Hill, who could swing the game with a hot streak. And in that potential Elite Eight match-up, it’ll be fascinating to see if Michigan State marksman Matt McQuaid can tear Duke apart the way he did Michigan’s vaunted defense in the Big Ten Championship Game. 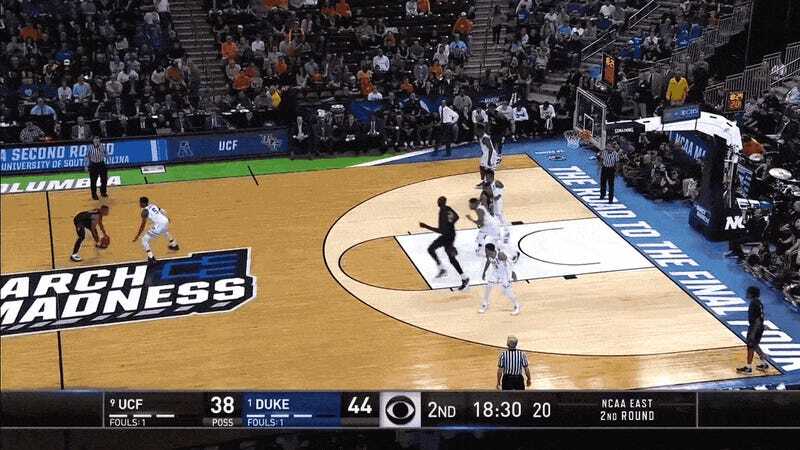 UCF’s unlucky roll at the end of the second round made it clear to everybody that Duke isn’t invincible—that even the third-best team in the American Athletic Conference could race the tournament favorites to a photo finish if they executed a smart game plan. That doesn’t make Duke any less terrifying an opponent. They still have the most potent weapon in college basketball, near-complete ownership over the area around the basket, and quick defensive hands with a seemingly precognitive knack for taking the ball away. But Duke also has weaknesses, small as they seem to be when they’re playing at their best. If the Blue Devils are going to go down in the next four games, a team’s going to have to latch on to all the soft spots, and exploit them without mercy.